I really thought that I would keep the green mirror from my Fall Mantel up for Christmas, too, but it just wasn't working out. So, we played a little bit of Musical Mirrors. I moved the mirror from the entry to the mantel and used a mirror that I'm putting in my bedroom in the entry-I'll show it to you later in the week. 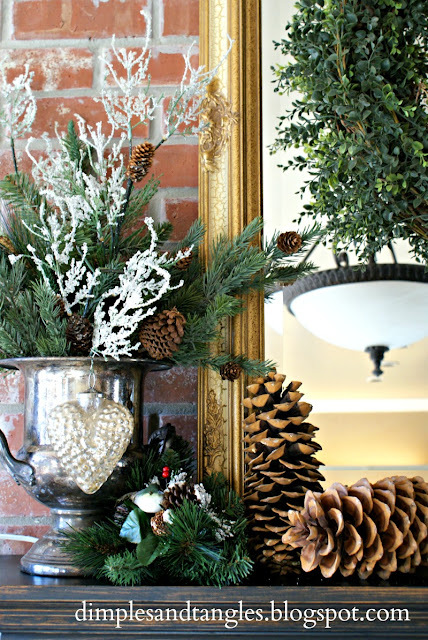 This year I wanted a mixed metal, natural, rustic look with some vintage pieces thrown in. 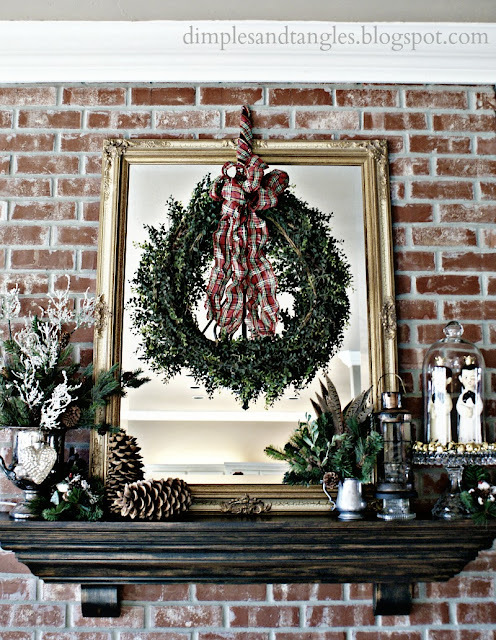 I re-used a faux boxwood wreath that I made last year inspired by Better Homes and Gardens layered over the mirror. I've always wanted some giant sugar pinecones (we can't pick those up off the ground in Oklahoma), and came across them at Hobby Lobby this year. 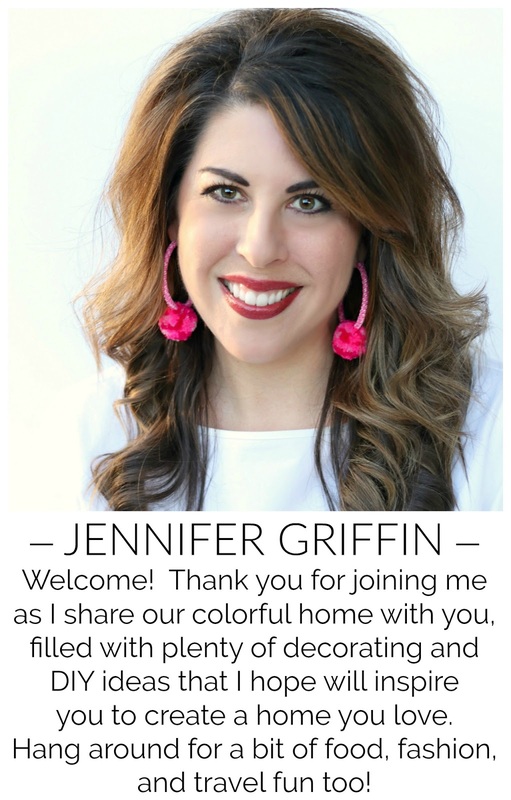 Love your mantel, Jennifer! All of the accents are wonderful; and the choir boys are fabulous! Great find! Everything looks so pretty! BEAUTIFUL!! I love all the greenery! LOVE IT! 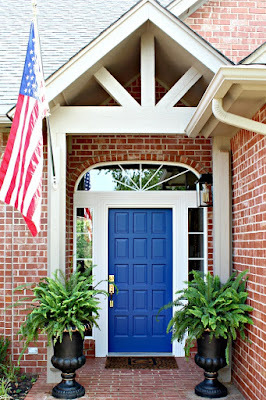 So pretty and classic. I love the pinecones. Love the choir boys. 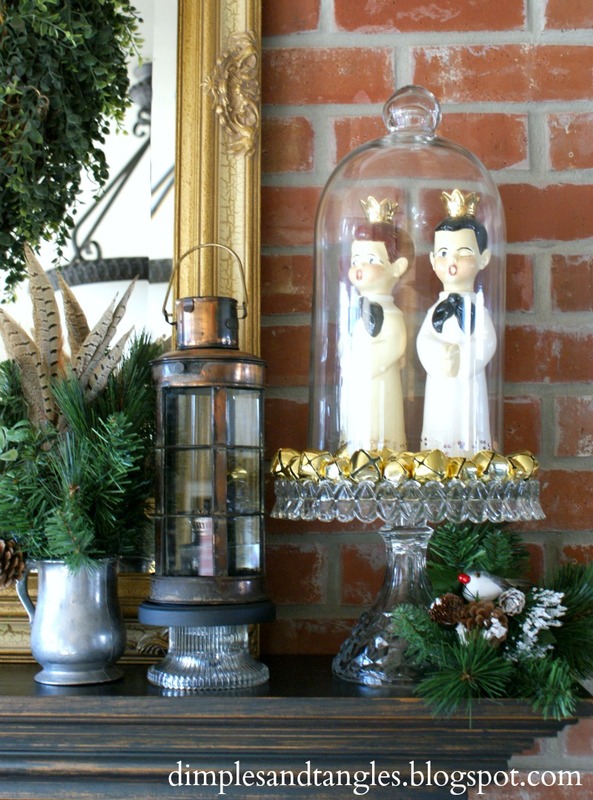 Vintage ornaments just bring such a warm and fuzzy feeling to Christmas, I think. I think I am obsessed with your brick...so anything up against that just takes my breath away! Love it! So very pretty! Love everything about it. One question, why can't you pick the pinecones of the ground in OK? We were just up in Tulsa for thanksgiving, and my little one and her cousin each got one of the floor...oops. love it! i love the vintage touch of those little angel/choir boys! Very pretty!! I like all of the natural elements! I also like the big stump with the pretty gifts on top. It all looks warm and inviting. Lovely! I look forward to having a mantel to decorate next year. So pretty Jennifer! 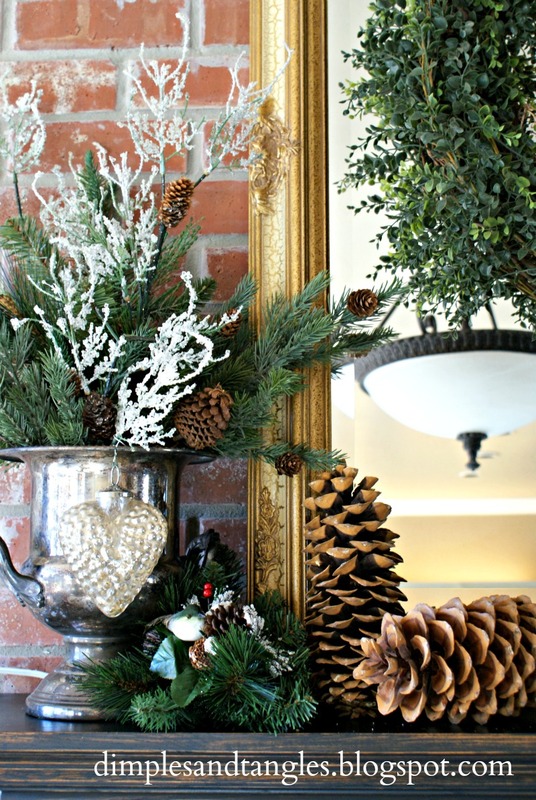 I love the natural with a bit of sparkle - you are so great at putting together vignettes! Great mantel. I love the brick backdrop - makes it so warm and welcoming. 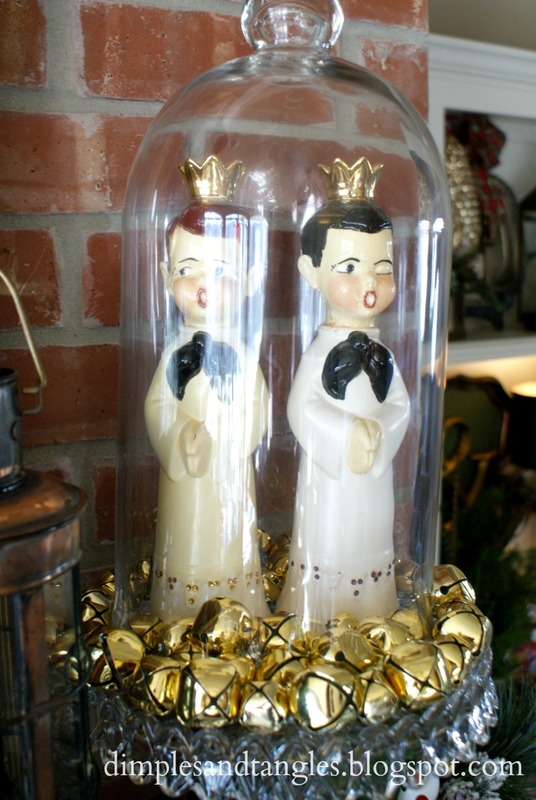 Adorable choirboys! So fun! 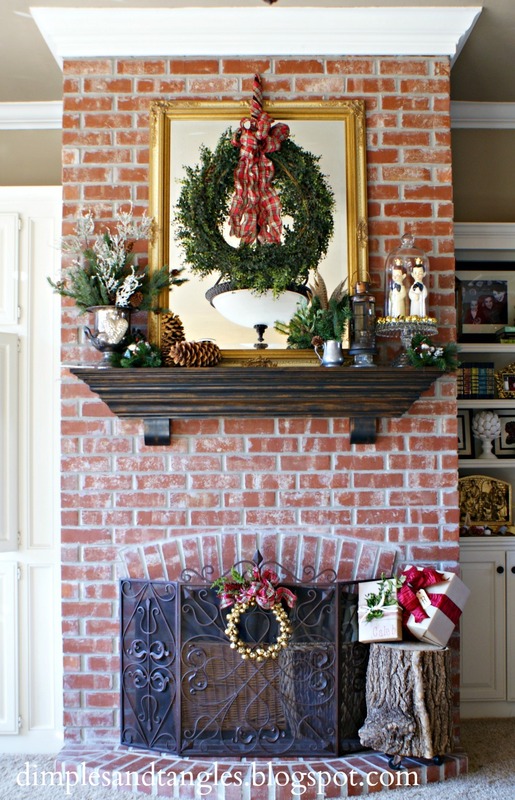 Would love if you came by the mantel party to link up!! Love your mantel. I love the boxwood over the mirror and the little choir boys. Also, love the greenery and feathers. 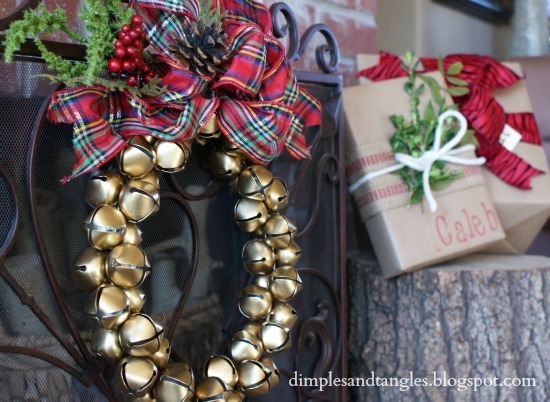 Thanks so much for sharing it at our Home for the Holidays link party. Those choir boys are darling. The whole mantel is like a magazine cover!